I originally published this article on September 24, 2014. 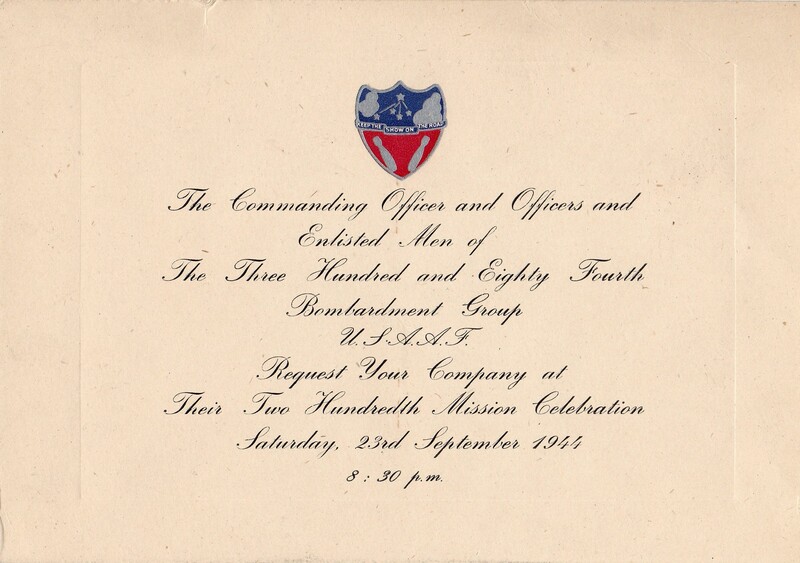 Realizing that the seventy-fifth anniversary of the 384th Bomb Group’s 200th Mission party would coincide with the date of the last day of the 384th Bomb Group Historical Association’s 2019 reunion and farewell dinner, held in England this year, I decided to review the article and found a few errors. So I’m republishing it today with corrections. (I have corrected the original, too, so if you look back at the 2014 article, you’ll just see this same information). On September 23, 1944, the 384th Bomb Group celebrated their two-hundredth mission, although that milestone mission would actually be flown four days later. Mission 197 was flown on Thursday, September 21. The party was on a Saturday – September 23. Mission 198 was flown on the 25th, and 199 on the 26th. The boys reached mission 200 on Wednesday, September 27. The 384th Bomb Group formed the 41st CBW “A” wing for Mission 200’s attack on the railroad marshalling yards of Cologne, Germany. On Mission 200, there were several mishaps and not everyone made it back to Grafton-Underwood alive. The Donald George Springsted crew and Bert O. Brown, Jr. crew were involved in a taxi accident prior to takeoff. The Brown crew’s aircraft, 44-6080, had to be scrapped. The Springsted’s aircraft, Sneakin’ Deacon, was repaired in time to fly the next day’s mission. The Loren L. Green crew aboard Pro Kid had to abort and turn back due to an internal failure in an engine. The James W. Orr crew aboard Tremblin’ Gremlin II experienced a bomb bay door malfunction over the target. The bomb bay doors could not be opened, either electrically or manually. Gremlin returned to base still loaded with all of her bombs. The John H. Hunt, Jr. crew had a harrowing landing. Boss Lady’s tail wheel would not extend for the landing. Fortunately, no one was injured. The William J. Blankenmeyer crew landed with wounded aboard. Rebel came back with an injured tail gunner, Robert H. Hoyman. Navigator Richard Leroy Lovegren of the Raymond J. Gabel crew aboard Fightin’ Hebe was killed by flak. He is buried at Cambridge American Cemetery, Cambridge, England: Plot E Row 5 Grave 12. I will have the opportunity to visit Lt. Lovegren’s grave during the 384th’s visit to the American Cemetery at Madingley during the reunion. My dad, George Edwin Farrar, completed Mission 200 with the John Oliver Buslee crew aboard Hale’s Angels, which was the high group deputy and hot camera ship. They completed the mission without incident. The James Joseph Brodie crew did not fly Mission 200, but both the Buslee and Brodie crews would be part of the bomber stream for Mission 201 on Thursday, September 28, 1944, and it would be their last. The Buslee crew aboard 43-37822 and the Brodie crew aboard Lazy Daisy collided coming off the target at Magdeburg at about ten minutes past noon. Aboard the two ships, fourteen men lost their lives, and four became prisoners of war. What a difference one mission could make for an airman in WWII. For the Buslee and Brodie crews, Mission 200 was a celebration, Mission 201, a disaster. The Challenger was lost on February 3, 1945 when the pilot was forced to ditch in the North Sea. Ball turret gunner Jack Coleman Cook saved the life of navigator Edward Field on this mission and The Challenger sank to the bottom of the North Sea. I believe this letter was the one that followed the New Year’s Eve telegram to the Farrar family that brought the news of their son George Edwin Farrar’s imprisonment by the German government. The Prisoner of War Information Bureau, Office of the Provost Marshal General, receives and records the names of American prisoners of war and civilians reported interned by the Enemy Powers. 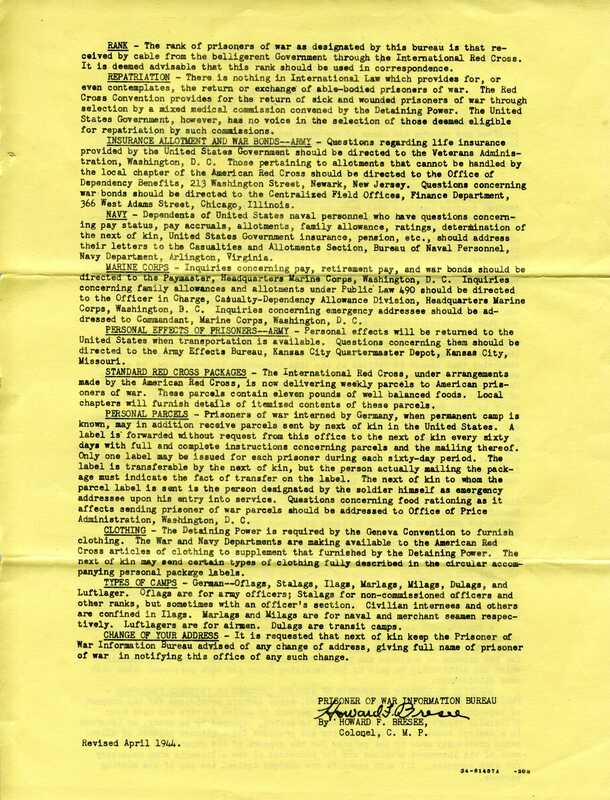 It answers inquiries and furnishes available information concerning American prisoners of war and civilian internees to those interested. The following information, subject to change, is substantially all that is available at this time. TREATMENT AND CONDITION OF PRISONERS OF WAR – Reports received from neutral sources indicate that American prisoners of war interned by Germany, Hungary, Rumania, and Bulgaria are receiving fair treatment and these Governments are complying substantially with the terms of the Geneva Convention considering all the circumstances which accompany war. This convention requires each interment camp to have a properly equipped infirmary with adequate medical personnel in attendance. Prisoners of war must be medically examined at least once a month, and any who are ill must be given treatment. It requires also that notification concerning capture indicate fact of wounds or serious illness. 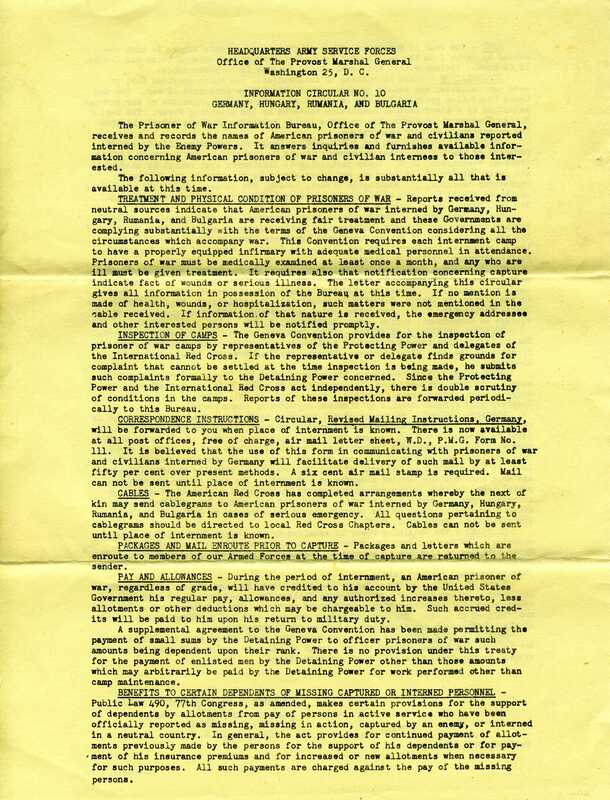 The letter accompanying this circular gives all information in possession of the Bureau at this time. If no mention is made of health, wounds, or hospitalization, such matters were not mentioned in the cable received. If information of that nature is received, the emergency addressee and other interested persons will be notified promptly. INSPECTION OF CAMPS – The Geneva Convention provides for the inspection of prisoner of war camps by representatives of the Protecting Power and delegates of the International Red Cross. If the representative or delegate finds grounds for complaint that cannot be settled at the time inspection is being made, he submits such complaints formally to the Detaining Power concerned. Since the Protecting Power and the International Red Cross act independently, there is double scrutiny of conditions in the camps. Reports of these inspections are forwarded periodically to this Bureau. 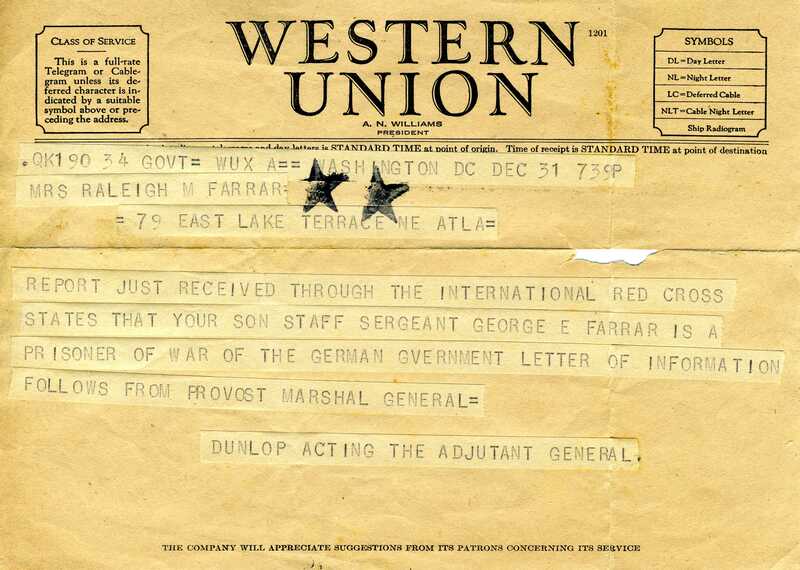 On New Year’s Eve, December 31, 1944, a telegram arrived at the Farrar household in Atlanta, Georgia. The news that George Edwin Farrar’s family had been waiting for had finally arrived. Their son was alive. He was a prisoner of war, but he was alive. It had been ninety-five days, more than three months, since the September 28 mid-air collision between the Lead Banana, on which he was the waist gunner, and the Lazy Daisy. It was the first word any of the families of the boys in the crew had heard that one of their own was safe. As telegrams tended to be, it was short, but this one was oh so sweet. Dunlop Acting the Adjutant General. Farrar’s mother, Raleigh Mae Farrar, did not waste any time contacting the families of the other boys on the Busee crew to share the good news. Today I received from the War Department the names of the crew on the B-17 (Flying Fortress) on which my husband, S/Sgt. Gerald Lee Andersen, was reported missing in action since September 28 and also the names of the next of kin. I received the information that the plane was damaged by antiaircraft fire and forced down near their target over Germany. I would like to know if you have received any information concerning your son, S/Sgt. George E. Farrar, safety. I wish to keep in contact with all next of kin in case any of us receive any information that we may exchange. My anxiety as I know yours has been great and we hold on to every hope of their safety. My sympathy is with you. May I hear from you soon. Esther’s husband, Gerald Lee Andersen, was the tail gunner on the Joe Carnes crew in the 544th squadron of the 384th bomb group. Andersen’s first mission with the 384th was the August 7, 1944 mission 174 to an oil depot in Dungy, France. 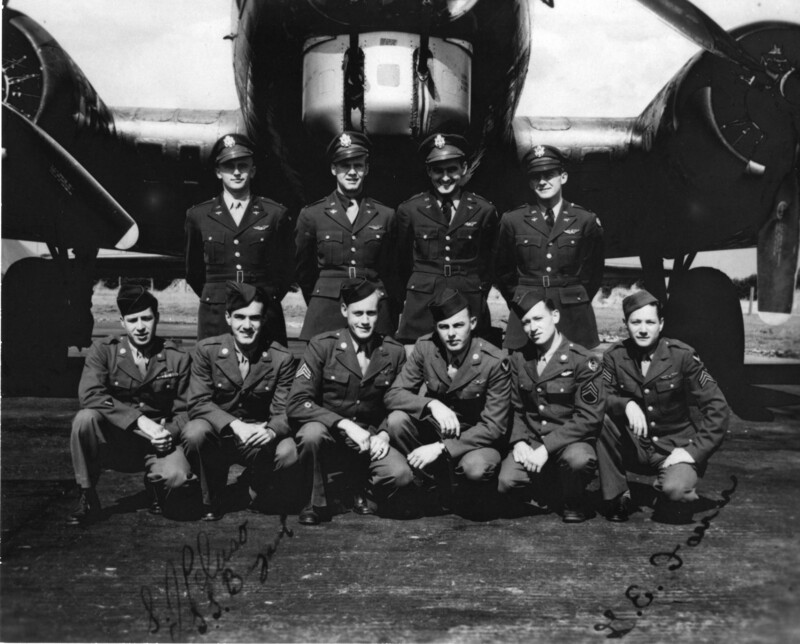 Andersen flew nine total missions with the Carnes crew, the last being September 13, 1944. Eugene D. Lucynski was the tail gunner on the John Buslee crew, also in the 544th squadron of the 384th bomb group. Lucynski’s first mission with the 384th was the August 4, 1944 mission 171 to a rocket R&D facility – CROSSBOW (V-Weapons) – in Peenemunde, Germany. Lucynski flew twelve total missions with the Buslee crew, the last being September 11, 1944. For reasons unknown, Lucynski flew his next two missions with the Carnes crew, replacing Gerald Lee Andersen as tail gunner. Mission 195 on September 17, was a tactical mission to s’Hertogenbosch, The Netherlands. Mission 196 on September 19, was to the railroad marshalling yards in Hamm, Germany. On the September 19 mission, the Carnes crew was aboard the Tremblin’ Gremlin. The Gremlin was struck by flak, and after bombs away, left formation under control. The crew, including Eugene Lucynski, who had replaced Gerald Lee Andersen as tail gunner, bailed out over Binche, Belgium. Landing in allied territory, the crew eventually returned to duty, with the exception of seriously injured ball turret gunner, James B. King, Jr. The temporary absence of the Carnes crew left Andersen to fill in with other crews. Andersen’s next mission was mission 198 on September 25 to the railroad marshalling yards at Frankfurt-am-Main, Germany. 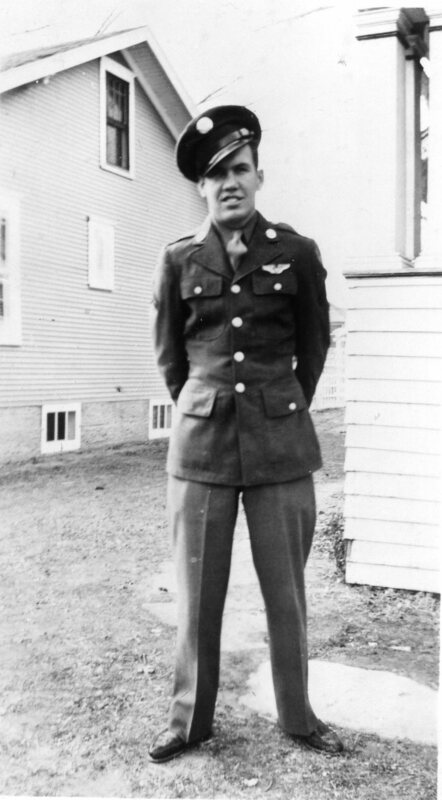 He flew as tail gunner on the John Buslee crew replacing Eugene Lucynski, who had taken his place on the Carnes crew. The Bulsee crew didn’t fly on September 26, so on that date on mission 199, Andersen flew with the Joseph D. Patella crew. Andersen’s next two missions on September 27 and September 28, however, would be back on the Buslee crew again, replacing Eugene Lucynski. This series of crew changes resulted in Gerald Lee Andersen flying as the tail gunner aboard the Lead Banana on September 28, 1944 when it collided with Lazy Daisy coming off the target at Magdeburg, Germany. Whatever the reason behind the switch in tail gunners for the two crews, it saved Lucynski from being on the Lead Banana on September 28, and put Andersen on that ill-fated flight, where he lost his life. Gerald Lee Andersen was born on June 20, 1923. He was only 21 years old when he lost his life on September 28, 1944 in the mid-air collision between Lead Banana and Lazy Daisy. He is buried in Fort McPherson National Cemetery in Maxwell (Lincoln County), Nebraska in Section F, Site 1229. The photo of Andersen was sent to Raleigh Mae Farrar (George Edwin Farrar’s mother) on April 7, 1945 by Andersen’s wife, Esther. On the back of the photo she described her husband as 5-feet 7-inches tall, weighing 140 pounds, with dark wavy hair, green eyes, and a fair complexion. She noted his age as 22, which he would have been, had he lived, in June of that year. Esther Andersen’s letter of April 7, 1945 will be published in a future post. On Christmas day, George Edwin Farrar was allowed to write home again to his family. He was a prisoner of war in Stalag Luft IV, and now out of the hospital and in a regular barracks in the prison camp. His family still did not know if he were dead or alive following the mid-air collision of September 28, 1944. He had previously written two letters home from prison camp – on October 24 and November 9 – but neither one had been received by his parents at the time he wrote this third letter. Dearest Mother: Hope everyone had a nice Christmas. We had as good as can be expected here. I am sorry I can’t send you a birthday card but do hope that you have a nice one. If you get a chance I wish you would send me some cigars, as I still don’t smoke cigarettes. Love to all, George. His mother, Raleigh Mae Farrar’s, fifty-fifth birthday was a month away on January 25, 1945. My grandmother, Raleigh Mae Farrar, must have replied to Mr. Buslee’s first letter of November 27, as this second letter from Mr. Buslee indicates. Since that time, both families apparently received the same letter from the Army Air Forces providing some details of the September 28 incident in which their sons were reported missing. Mr. Buslee wrote to my grandmother again on December 16, 1944. Your recent letter was duly received and I have delayed a reply in the hope that each day would bring some word about your son and the rest of the crew. Thus far the only definite word is a letter from the War Department dated the 10th of December which advises that the plane was shot down by enemy flak over the target at 12:10 P.M. at Magdeburg Germany on Sept 28th. They state that they have no further word pertaining our son John Oliver and that when they do they will advise us. From what we have heard from many friends such word is supposed to be very encourageing. In other words a delay usually means that the men are safe and will be reported in due time; so it seems that we must have faith and be patient. We too had a letter from the navigator and in it he tells us the same as sent to you. Well that is perhaps the best he can do with the restrictions placed on him and we are very appreciative of his writing to us. From what we have heard the missions are indeed strenuous and truly it is a wonder that the boys that made these trips ever feel like writing. Our son was quite a faithful correspondent so you can realize what the absence of any mail from him means to us and especially his Mother. Then too the letters that we sent to him are returned as well as boxes all of which are a sad reminder that the boys are really worse off than we at home. However the youth of this country are showing what a wonderful lot of boys they are and I marvel at the spirit they have under these trying times. They should be an inspiration to the older folks. I note that you have a crew picture and thinking that you may not know who they are I am sending a list of names in the event that this will interest you. To look at that group one can well understand what I mean when I say the youth are wonderful. To my mind that is as fine an assortment of manhood as one could find anywhere and I count it a privilege that my son is among so fine a crew. Yes I had the good fortune to meet all of them in Ardmore last June and I trust it will be my pleasure to again meet all of them and more that this may be real soon. Should you or any of your family get to Chicago I trust that we may have the pleasure of your call as we live in a suburb of Chicago only 17 miles from downtown. Mrs. Buslee and my daughter join me in sending to your our sincere greetings and that you will soon hear favorably from your fine son with the good word that he is hale and hearty. The navigator mentioned in Mr. Buslee’s letter was Chester Rybarczyk, the original navigator on the Buslee crew who flew with a different crew on September 28. He sent a letter to the Farrar family on October 12, 1944. George Edwin Farrar and the other boys aboard the Lead Banana and Lazy Daisy have now been missing for seventy-two days. The only official communications the families have received have been a letter from the 384th Bombardment Group Chaplain, Dayle R. Schnelle on October 9, 1944, a telegram from Adjutant General Ulio on October 14, and a letter from Adjutant General Ulio on October 17. All reported the same information – their sons were reported missing in action on September 28. Finally, almost two months from the original communication, the families received the following letter providing the first details of September 28. The details provided at this time were partially inaccurate. Surprisingly, the letter informs the parents of the target location and time of day of the incident. The report does not state the fact that their son’s bomber collided with another 384th bomber. Also, neither of the bombers were reported to have sustained any anti-aircraft fire in any official reports of the mid-air collision. This letter states otherwise. I am writing to you with reference to your son, Staff Sergeant George E. Farrar, who was reported by the Adjutant General as missing in action over Germany since September 28. Further information has been received indicating that Sergeant Farrar was a crew member of a B-17 (Flying Fortress) bomber which departed from England on a combat mission to Magdeburg, Germany, on September 28th. The report indicates that during this mission at about 12:10 p.m. in the vicinity of the target, your son’s bomber sustained damage from enemy antiaircraft fire. Shortly afterwards the disabled craft was observed to fall to the earth, and inasmuch as the crew members of accompanying planes were unable to obtain any further details regarding its loss, the above facts constitute all the information presently available. Due to necessity for military security, it is regretted that the names of those who were in the plane and the names and addresses of their next of kin may not be furnished at the present time. Please be assured that a continuing search by land, sea, and air is being made to discover the whereabouts of our missing personnel. As our armies advance over enemy occupied territory, special troops are assigned to this task, and all agencies of the government in every country are constantly sending in details which aid us in bringing additional information to you. Assistant Chief of Air Staff, Personnel. December 8, 1944 was an important date for another reason back in the states for the wife of one of the Buslee crew members. The co-pilot’s wife, Patricia, gave birth that day to her and David Franklin Albrecht’s baby. With her husband now missing in action for seventy-two days, this day must have been bittersweet for Mrs. Albrecht. As she welcomed her daughter into the world, her thoughts must have been on her husband and that someday he would be home to meet his child. In 1944, Thanksgiving came and went without any of the Buslee crew families hearing any additional news about their sons. The following Tuesday would mark two months since the mid-air collision between the Lazy Daisy and Lead Banana on September 28. The day before that sad anniversary, John Buslee, the Lead Banana pilot’s father, wrote a letter to the parents of my dad, George Edwin Farrar. Mr. Buslee had visited the boys in Ardmore, Oklahoma before they left the states for England and must have asked for home addresses at that time. The War Department had not released Next of Kin information to the families at this point. It was my pleasure to meet your son, George, in Ardmore, Oklahoma last June just before the boys flew to England. My son, John O., was the pilot of the plane and as we were notified on October 13 that our son was missing in action over Germany on September 28, we presume that your son, George, was also on the plane. We have been under a lot of suspense since that time and imagine that you have also wondered what has happened to the boys. In an effort to learn something about them, we have made some inquiry and the best hope we get is that no word from them could mean that they are prisoners of war and thus it would take several months before word would reach us from Washington about them. Naturally, we are very anxious to learn something as to their whereabouts, and I am writing to you in the hope that you have been fortunate enough to have heard something from your son. It seems that there are instances when names of missing are mentioned over the short wave radio and the next of kin have thus been advised through this medium long before any official word comes from Washington. Early in September we received a snapshot showing the crew members and the plane. The boys all looked fine and seemed to be in the same high spirit that they enjoyed when we met them in Ardmore. I presume you also have one of these pictures. If not, I have an extra one and could send it to you. I sincerely trust that George will return safely and soon. Meantime, it seems we at home will have to have the faith that our prayers are answered and that the boys are in no danger. As an interesting side note, the only men who signed my dad’s copy of the photograph were the enlisted men that were original Buslee crewmembers who were on the Lead Banana on September 28 – Sebastiano Peluso, Lenard Bryant, and George Farrar.